IT'S A GAME OF LIFE AND DEATH BETWEEN THE GAMER SIBLINGS AND A GOD! Subsequent to the eternal Great War, Disboard-the world where everything is decided by games and wagers rather than violence-is born. But winners still trample losers, and the victims pile up. 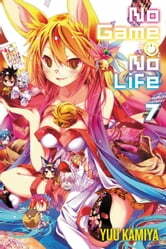 A young Shrine Maiden laughs at how nothing has changed... Sora and Shiro agree to a dice game in which the number of dice you have is determined by your age, but in a contest where all the players are pitted against one another and death hangs in the balance, will the sibling gamers survive or lose everything-including their lives?